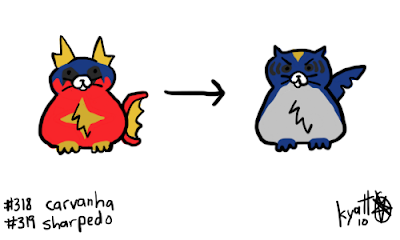 Carvanha and Sharpedo are two of the unfortunate Pokémon from Ruby/Sapphire that probably had 3 or 4 of those crappy water HMs used on them all the time. Anyway, if you count all the Unowns as one entry, this is the 150th entry into the ImPokédex, which means that I have made about 5 solid months worth of just these cats. Just something to think about - you and me both.